For patients suffering from severe tooth loss, customized dentures from Dr. Olsen can provide the reliability and affordability you’ve been searching for in a dental restoration! 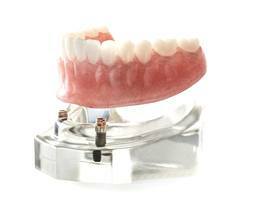 A full denture consists of a complete row of top or bottom teeth that are attached to a gum-colored base. Partial dentures, on the other hand, are designed like a puzzle piece, providing the new replacement teeth you need while still allowing you to keep your natural ones. 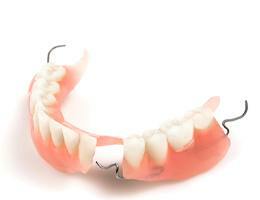 Both kinds of dentures are lifelike, comfortable, and removable, allowing for easy cleaning. Plus, they help alleviate the problem of facial sagging that usually occurs when multiple teeth are lost. 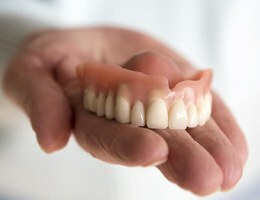 Some patients discover that their dentures take years off of their appearance! If you’ve lost any number of teeth, we encourage you to contact our team right away to schedule a dentures consultation. 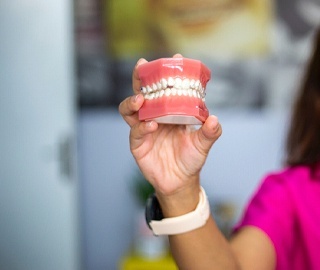 Partial dentures, sometimes referred to simply as partials, are custom crafted dental prosthetics used to fill any number of gaps in a patient’s smile. Partials can be used to replace consecutive and nonconsecutive teeth while preserving the remaining healthy dental structure. 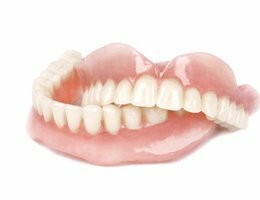 Partial dentures are composed of three main components: replacement teeth, gum-colored base settings, and metallic attachment clasps. Our customized dentures are crafted by our trusted dental lab to restore smiles following tooth loss. Patients should plan to visit our office at least two times in order to receive their custom partial. During the first appointment, we may need to remove one or more damaged teeth. Then, we’ll take X-rays and impressions of the teeth. These images and impressions will be used by Dr. Olsen to design the partial, and these designs are then brought to life by a skilled technician in our dental lab. When we receive a prosthetic from the lab, a patient will return to have their partial attached. In rare cases, we may need to send the partial denture back to the lab for further alteration, but typically, we’re able to make any minor adjustments necessary in our office, allowing patients to leave with a completed smile. Full dentures are similar to partial dentures in that they are a prosthetic that combines replacement teeth with a gum-colored base. However, they are used to replace a full arch of lost teeth, so we are unable to attach them to remaining teeth for support. Instead, the base is precisely formed to fit against a patient’s gums and jawbone. This close fit creates suction that holds the denture in place, though some patients prefer to use denture adhesive to provide added support. Traditional partial and full dentures are removable. Patients should remove their dentures at night and store them in water or a cleaning solution. Additionally, patients should brush their dentures with specially crafted denture toothbrushes and minimally abrasive toothpaste. During six month checkups, our team will examine the denture and make any adjustments necessary to ensure long-lasting, comfortable wear. Here in Ann Arbor, MI, Dr. Olsen will be happy to meet with you before any treatment begins in order to discuss your unique needs and concerns regarding your dental care. Dental implants are also available as a tooth replacement option. Contact our office today to schedule a consultation with our team!